Alhamdulillah we are asking to enter Allah ‘Azza wa Jal’s Oceans of Rahmah and mercy, and that to share from their teachings, and that InshaAllah, open the horizon of the soul. And to understand from how they understand so that to open, as they say in English to get out of the box: ‘think outside the box’. Alhamdulillah this is in the ilm ul huroof and the understanding of ilm ul huroof. Those that don’t understand, no problem, just you write it if you can write it, if not then just look at it, it is good enough for the soul. Later the soul begins to understand and these realities dress the soul. 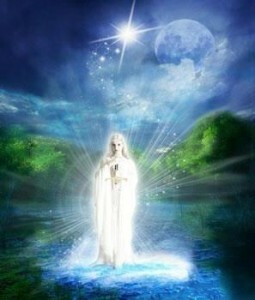 As soon as the physicality gets out of the way when we sleep, the soul goes to the heavenly realm and begins to ask that, “I heard from this reality. Dress me from that.” That’s why Prophet (sallallahu alaihi wasallam) said, “Seek knowledge even if you go to Chin,” or Sin, all the way to China or the Seen, Sir [secret], there is secret here that Prophet (sallallahu alaihi wasallam) is describing. It means that the path of our reality of our life should be in seeking knowledge, in seeking wisdom and realities. These knowledges open the reality of the soul in dunya (material world) to achieve the rank that the Divine wants for it in aakhirah (hereafter). If not seeking knowledge, then it is like spending our life in kindergarten; that we came and left and we never left kindergarten. So Alhamdulillah Allah ‘Azza wa Jal destined for us to be under the hands of amazing saints that carry tremendous realities. And to share from the understanding of their reality. That, for those that are not only necessarily knowing Qur’an, because we know nothing, but just who look at the kalam and understand that the Arabic and the secret in which Allah ‘Azza wa Jal describing Arabic is a language from paradise, and with it contains the realities of paradise. And every other language is a drop from that ocean of reality. So going back to that origin that teaches us from Allah ‘Azza wa Jal’s Divinely Codes, ancient Divinely Codes. When we look at a word, we look from the world of form, and we say, “Oh! Got it,” because of, we’re thinking within the box. They begin to teach us that every kalam has a huroof and these are the ingredients in which Allah ‘Azza wa Jal dresses that word. Don’t look at only the word and what your dunya perspective because based on your mom, your dad, your conditions, your teachers. They taught you what that word means. That word has a meaning based on your conditions and surroundings and understandings, many layers. But yet we don’t know what Allah ‘Azza wa Jal is meaning by that word. So the heavenly knowledge and the pursuit of heavenly knowledge, they begin to teach us that basic huroof understanding. And these knowledges may go, they say 12,000 layers of reality, which for us, once you go beyond two, three, four layers means it has infinite capacity. 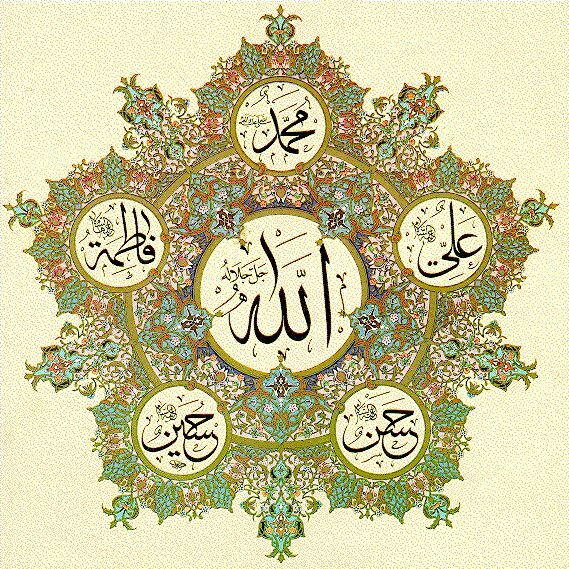 When you say ‘Allahu Akbar’ means there is, Divine is Supreme beyond imagination. You can’t put any limit onto the Divine. So the pursuit of this knowledge and these realities is that everything begins to open as we move towards that ocean. So then the Divine begins to teach through Prophet (sallallahu alaihi wasallam), Prophet (sallallahu alaihi wasallam) through Ashab un Nabi (sallallahu alaihi wasallam) through Ahl ul-Bayt to awliya Allah, that each letter has an ingredient. And that ingredient is what’s dressing that word. 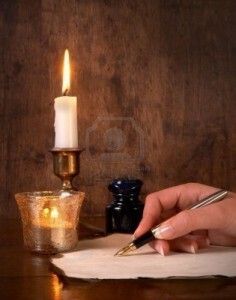 So then move beyond the form and begin to look at what’s the ingredients of that letter. ‘Khalaqal insaan min ‘alaq’, “I created insaan, humanity, ‘min’, from, ‘’alaq’. There are many books now written on ‘alaq: an ‘alaq is a clinging clot. And that clot clings. Because it’s a clinging matter, and they say, “Oh, this is description of the clot that clings within the uterus.” And the Divine is teaching that, that clot clings onto the uterus. Allah ‘Azza wa Jal’ then describing the process of birth 1500 years ago, that, “I created your humanity with a clinging clot,”. Means the egg that becomes fertilized, it becomes a clinging matter and it clings to the uterus. What does “Min ’Alaq من علق ” mean? meem م is Muhammad محمد (sallallahu alaihi wasallam). Every time we see meem م , there must be a Muhammadan reality that Allah ‘Azza wa Jal wants us to understand within that word. Noon ن is the nur نور (light) of Muhammad (sallallahu alaihi wasallam). So now, becoming even now clear towards haqqa’iq (realities), because we leave the world of form. That now to understand, the reality is that for every creation that coming into existence in dunya, coming through a womb from our humanity. 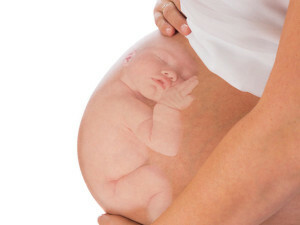 Means that within the womb of a woman creation is being formed and coming into dunya. So then awliya Allah begin to teach us that, no doubt Allah ‘Azza wa Jal is the Power behind that, but He gave a tremendous secret to women, that within their belly, creation is coming. So you can’t say it’s all Allah ‘Azza wa Jal. Allah gave the secret. But there is a tremendous reality within the womb of a woman, that makes this clot, forms it, skin and flesh and veins, and now it’s becoming an insaan (human being). As soon as it’s born, that noor نور is dressing it and becoming insaan. And awliyaAllah are teaching that is a tremendous secret that women have. But, where they got that secret from? Sayyidena Muhammad (sallallahu alaihi wasallam). Because everything, if you’re talking from the world of creation, nothing goes directly to people. For that secret, the sirr سر, the secret of that reality to become and manifest in dunya (material world) and go to any man or any woman, its sahib, its owner must be our Imam (alaihis salaatus salaam), who’s Imam al-Mursaleen, he is the Imam of all the prophets (alaihis salaatus salaam). Means that he is the custodian and the owner of that secret. That, that secret coming to Prophet (sallallahu alaihi wasallam) and Prophet (sallallahu alaihi wasallam) giving that out to creation. ‘Cause every knowledge, every reality is in Holy Qur’an, and who is the one revealing Holy Qur’an to creation? Is Sayyiduna Muhammad (sallallahu alaihi wasallam). Then they say: look again at ‘alaq علق . What Allah cares for the form? What’s dressing ‘alaq علق’ that making this have so much power? You want to understand this ‘Aynع . What is Allah ‘Azza wa Jal’s ‘Ayn ع ? It’s ‘Aleem عليم, Allah’s Ancient Knowledge, Al ‘Aleem العليم. Means now the ingredients of this word, the ‘Ayn ع will draw your attention: there is an ancient knowledge Allah ‘Azza wa Jal has put. When someone brings you a cake, it didn’t come from nowhere. These ingredients are all the same. It can be very complicated by adding additional, but the basic going to be flour, salt,baking powder; means there’s ingredients in everything. So Allah ‘Azza wa Jal says, “Any time you see My ‘Ayn ع, may have many different knowledges and realities, it’s up to 12 000.” But most easy for us to understand is Allah’s Ancient ‘Al-‘Aleem العليم must be in that reality, Ancient Knowledge. So then three Khalifas have what names AbdAllah/AbuBakr, Ali, Uthman and Umar All Start with “Ayn” four ancient knowledges dressing these souls. It’s not by coincidence. Allah gave us these names and gave us “‘alama Adam isma kullaha”. 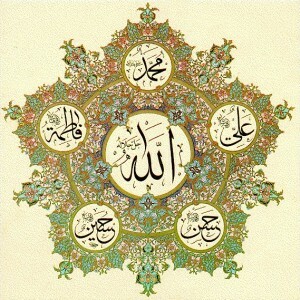 Allah says, “I taught him all the names,” means the names were already written in the Divinely Presence. Allah ‘Azza wa Jal already put all of the ingredients into every name. So it’s not a random name that you know, Sayyiduna ‘Ali (alaihis salaam), somebody contrapted the name and thought of it. Allah ‘Azza wa Jal says, “Isma kullaha. It was already in my Divinely Presence ‘cause it has all of the ingredients that that name and his reality is going to carry to dunya.” So then ‘alaq is carrying Allah’s Ancient Knowledges. 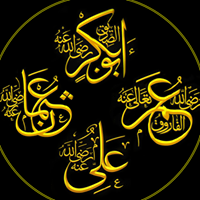 For more details on reality of Imam Ali`s Name, Refer to Secrets of Lam Alif and The Name of Imam Ali. Holy Quran 19:50 Yusuf Ali And We bestowed of Our Mercy on them, and We granted them Most High/lofty honour on the Tongue of Truth. Now this is a source of Ancient Knowledges flowing, coming to the lam. 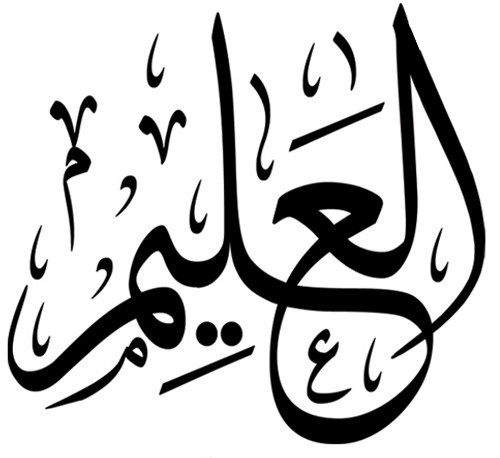 We said lam ل – lisaan al-haqq لسان الحق, ‘cause Allah ‘Azza wa Jal wants this knowledge to be known. It’s not just flying out throughout the universe. 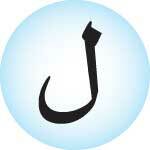 Any time we see a lam ل, it denotes A Mulk a Creation, awliyaAllah teaching that it represents a creation, a mulk ملك. Means for everything to exist, it has to have a manifestation. Yusuf AliNor does he say (aught) of (his own) Desire. Then your tongue allows what is in your heart to manifest. So when you recite and say something, it is now manifested. It has a reality, it’s now here. When it was khafiخافي (hidden) in your heart, it has a reality, it’s brewing. Once it comes out your tongue, it’s now here. So Prophet (sallallahu alaihi wasallam) said, “Guard your tongue,” ‘cause now what is here is very difficult to take back. ‘Cause now it has a reality, it’s written by the angels. So holding the tongue is supreme in our path. Sayyiduna Isa (alaihis salaam) said is like taking the elephant through the eye of a needle. Once it’s out you can’t put it back in. So then Allah ‘Azza wa Jal begin to teach that the lisaan, is that, “When I’m wanting something, I’m in the heart of the Prophet (alaihis salaatus salaam), in the heart of Sayyiduna Muhammad (sallallahu alaihi wasallam). Means in the world of light is the soul of Prophet (sallallahu alaihi wasallam). All the souls and light that are in that presence, there is no way to come into Allah’s proximity. There’s no way to breathe the air of Allah ‘Azza wa Jal, to share the space; Allah doesn’t breathe, but you cannot share the space, because becomes sharik (partner). 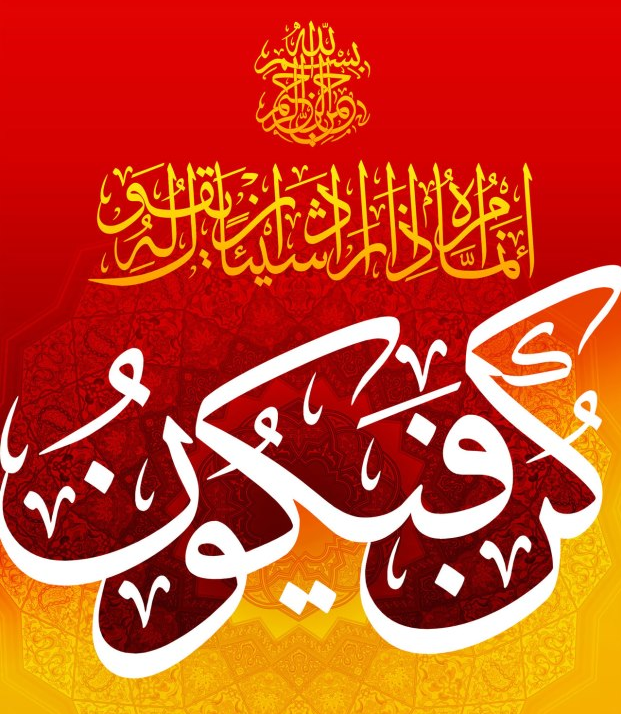 Amrامر – Alif ا, Meemم , Raر – Amr امر Allah means ‘Izzatullahi wa Rasooli wal-mu’mineen. Alif- ‘Izzatullah, meem- Muhammadun (sallallahu alaihi wasallam), wa ra- means these are the mu’mineen, who will do what Allah ‘Azza wa Jal’s order has been commanded through the holy heart of Sayyiduna Muhammad (sallallahu alaihi wasallam). So means this lam is lisaan al-haqq, is going to convey every reality, and then convey from what reality? From the Holy Qur’an, ‘Qaf wal Qur’an al-Majeed’. So when Allah ‘Azza wa Jal gave the order for, “Iqra!” means, “Activate everything that you have been dressed with, and bring out now these realities.” So for us ‘Iqra’ means not ‘sami’na’ (listen), Iqra: look, and then look again and then look again. And as you look, look with your heart. So means that ‘alaq and that reality is going to come later in the importance of Bismillahir rahmanir raheem. 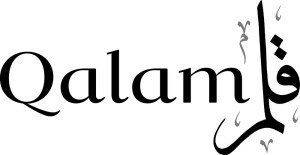 When Allah ‘Azza wa Jal dressing Sayyiduna Muhammad (sallallahu alaihi wasallam), dressing Sayyiduna ‘Ali (alaihis salaam), dressing Sayyiduna Fatima (alaihis salaam), Sayyiduna Hassan (alaihis salaam), Sayyiduna Hussain (alaihis salaam); from the kalimah, Bismi Allah Rahman Raheem. 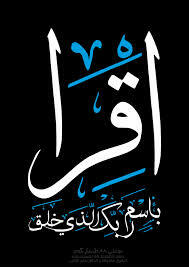 And the umbrella over all of it – Muhammadun (sallallahu alaihi wasallam) ‘cause he is the wal-Hamd, the Flag of Praise. Means they begin to teach us: when we look at this, that Allah ‘Azza wa Jal teaching that, “I taught by that reality and that all these realities are coming from that.” So then this Ancient Knowledge is moving on that holy tongue, that holy tongue manifesting Holy Qur’an. And then “‘Alam bil qalam”– there comes the qaf again. 96: 3 – Iqra, wa rabbukal akram. 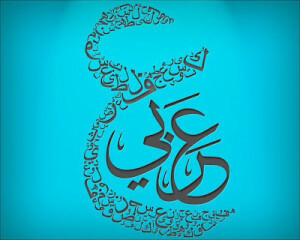 ’96: 5 – ‘Allamal insana ma lam ya’lam. Who can carry ‘Izzatullah like that? But Allah ‘Azza wa Jal says, “I speak to Sayyidina Muhammad (sallallahu alaihi wasallam) Holy Qur’an, and doesn’t move.” So any time ‘Qulقل ’, nothing in universe can carry ‘Qulقل ’. 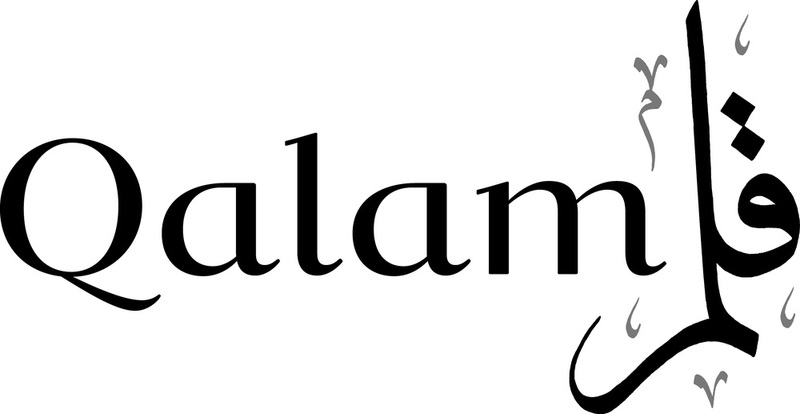 Qalam قلم – qaf lam قل (Say) Who? Muhammad (saws)! So then the qalam, begin to teach, that that Divinely Pen, in Divinely Presence is symbolic for Allah ‘Azza wa Jal speaking to Prophet (sallallahu alaihi wasallam). Qalam al-Qudra قلم القدرة, the Divinely Power, that Allah ‘Azza wa Jal speaks to the heart of Prophet (sallallahu alaihi wasallam), and Prophet (sallallahu alaihi wasallam) speaks to all creation; and “teach them that which they knew not.” Means that qalam, then for us is a secret. So then how, min ‘alaq? Allah teaching, “Your creation is not like a baboon,” ‘cause we said that everything is coming to existence by this reality. Prophet (sallallahu alaihi wasallam) given a knowledge and that knowledge is released into dunya, gives the knowledge to the women and the secret of their soul, they are able to make a child, bi ‘izzatullah. (by Majesty of Allah). 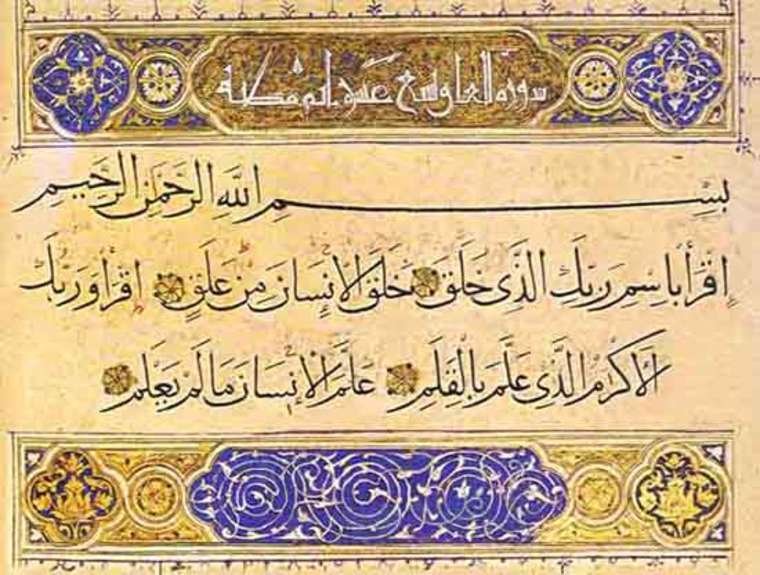 So then as soon as you hold the pen, they begin to teach: the pen is the reality of “Qul ya Muhammad (sallallahu alaihi wasallam)” [Qalam – Qul and Meem قل م – قلم Say O Muhammad (s).] It’s not something small, that between your index finger that you make your shahada and the thumb of your identity, it carries your reality. Your light comes out by your shahada finger. Your identity of who you are, Allah ‘Azza wa Jal says, “We will raise you on the Day of Judgement all the way up onto your thumbprint. I will reproduce all of creation, up to their thumbprint will be exactly who they are.” Your shahada finger brings the light of your soul out. As soon as you touch your shahada finger, it’s like a barcode. You’re scanning your reality and your light to come. Whatever Allah ‘Azza wa Jal has already bestowed upon your soul, it begins to be present. What’s Suratul Rahman,”’Alam al qur’an, khalaq al-insaan,” means, “everything already been taught onto your soul, then I sent you into your physical body.” So means all these realities are dressing; the pen that you carry is a holy pen, especially in the way of Allah ‘Azza wa Jal. 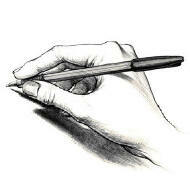 That’s why they say, “The pen is mightier than the sword,” ‘cause it’s the vehicle of conveying the Heavenly Knowledges. It is the secret of ‘kun fa ya koon’. When we say that saints have the power of ‘kun fa ya koon’, they merely make a du’a and it begins to manifest. The more that their heart is in submission, the more they are closer to the Will of Allah ‘Azza wa Jal, the more their du’a is accepted and these realities manifest in dunya. And then they come and teach us: but you have power too. Everything around us is based on that power to write. ‘Cause somebody wrote how to make this building, somebody drew plans. And based on how they drew it and what they wrote from what was in their heart, and what was told to them, it now manifests. So think back, if you were all alone on an island, Allah ‘Azza wa Jal says, “I gave you a heart, in which I merely inspire you and then gave you the ability through your finger and your index,”; ‘cause your thumb is your most important finger. They cut your thumbs then you’re like orangutan. “Through your thumb and your finger, you can write what I am inspiring within your heart,” and now all of a sudden what didn’t exist manifests. Somebody comes and then carved a stone into a circle. It wasn’t there before. So Allah ‘Azza wa Jal says, “What’s inspired within your heart is now manifesting in dunya,” and every building and every street and every house and every car, all of it is a manifestation. So Allah ‘Azza wa Jal says, “You have power of ‘kun fa ya koon’.” You’re inspired, you make it, it appears. If you are inspired towards the Divine, then it moves towards Allah ‘Azza wa Jal. If you are inspired towards shaytaan, then you are bringing in shaytaani understandings into dunya. So then Allah ‘Azza wa Jal says, “You have the power of ‘kun fa ya koon’,” and with little hand like that we are writing and manifesting many realities, so as soon as you write your reality, now your reality is now manifesting. So then what they want from us is to be from the noble scribes: Kiram ul Kaatibeen. Kiram, because they are honored, why? Because they keep the kitaab (book). That every word, Allah ‘Azza wa Jal describes that, “Every word like an ocean and every pen like the tree and My Words will never finish.” And every word the angels document, this is the secret of creation. They are documenting Allah ‘Azza wa Jal’s creation. That’s what makes them to be noble. Awliya Allah come into our lives and begin to teach us that if you want that ‘alaq and you want that reality, then Allah ‘Azza wa Jal teaching you the seven verses, “I’m going to teach you by the pen.” You hold the pen and that is from the haqqa’iq of Sayyiduna Muhammad (sallallahu alaihi wasallam), and not use your pen for negativity and badness, but use your pen to manifest the realities of your soul. As soon as you begin to write these realities, these realities are dressed on your kitaab. You write these realities, even if you don’t know how to write, just sit in the room and keep writing ‘Allah, Allah, Allah, Allah’, it writes onto your book and the angels dress you from that reality. If we are not preparing ourselves and not doing anything for that participation or for that preparation and we say, “Ya Rabbi, just open my heart for knowledges,”; where are you going to put those knowledges? Keep them in your brain for yourself? Then what was the purpose of that? Allah is not interested in greedy people. All the conditions have to be there, that, “They are My servants who are of service to creation.” And everything we have of Divinely Knowledges, somebody wrote them so that we can benefit from them. So we are becoming custodians of that reality, to be of service to Allah ‘Azza wa Jal’s creation, not for the empowerment and enrichment of ourselves. It’s not that we keep them. In dunya, whatever you learn, you keep that secret for yourself. So they have all these secret societies that keep all their knowledge for themselves. And they say, ‘Knowledge is power’, and they think of dunya power and how to manipulate people from what they know. And they don’t even meet with each other to tell each other what they know. And none of them can agree to do anything together. 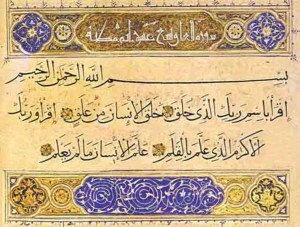 Bi hurmati Muhammad al-Mustafa wa bi sirri Suratul Fatiha.